Across the United States, homeless shelters, afterschool programs and crisis centers serve the needs of society. The leaders of these organizations must stay informed about the needs of the community, staff members and volunteers. Today, nonprofit leaders can stay informed about those needs by implementing big data systems. The resource empowers organizations to stay focused on their cause and sustain operations, while continuing to attract funding and support. Nonprofit organizations must justify their activities to attract support and donations. They can use big data systems to optimize the process of improving fundraising operations and making informed decisions, while monitoring and measuring the support of the community. Data can originate from many sources. This might include donor contact information, beneficiaries and past financial figures. The reports help nonprofit leaders discover opportunities for helping the organization achieve its mission. The data analysis process begins by deciding what information will provide useful answers. Resultingly, it's increasingly important that organizations maintain clean data records to facilitate the evaluation process. With accurate information, nonprofit leaders can develop a clear picture of the organization's activities. A recent survey revealed that 90-percent of nonprofit organizations collect useful information. However, nearly half of those organizations do not have a firm grasp on how to make the most of their data stores. This is expected, as most nonprofit organizations do not employ big data analysts. However, big data specialists can help nonprofit organizations maximize their time, effort and resources. These information experts organize and evaluate information, produce actionable reports and help organizational leaders decipher the meaning of big data analyses. Data analysis aids nonprofit organizations in connecting with benefactors, volunteers and supporters. The technology is steadily becoming a necessity for operating in the modern environment where all organizations are searching for better ways to operate. Ideally, it allows organizational leaders to identify weaknesses and strengths as well as find opportunities for improvement. All organizations cannot employ in-house big data specialists. However, there’s a growing crop of cloud-based, SaaS vendors who provide data services for small- to medium-sized organizations. These vendors work as consultants, sometimes providing freelance services. As a result, the technology is now accessible to organizations of all sizes. The right big data systems vendor helps nonprofit organizations spend less time on planning. Additionally, vendors can help organizations prepare for yearly audits and other important procedures. This development solves the problem of limited access to this innovative resource and allows organizations, big and small, to work toward the betterment of society. 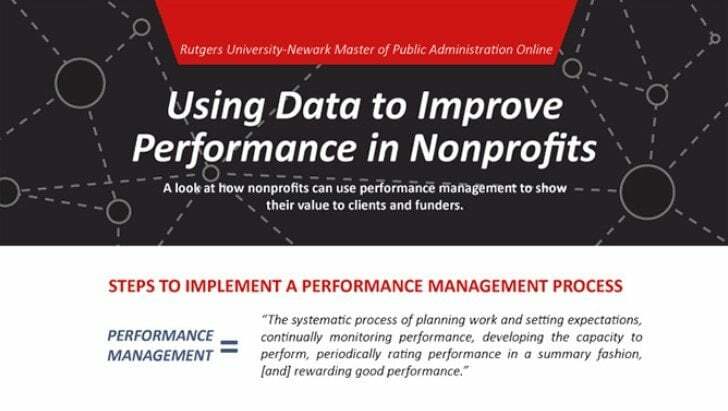 To learn more about how forward-thinking nonprofit leaders are leveraging big data systems to help the community, follow this link to view a stimulating infographic developed by Rutgers University’s Online Master of Public Administration program.